Finding that perfect gift that your child will love and not discard after only a few uses can be challenging. 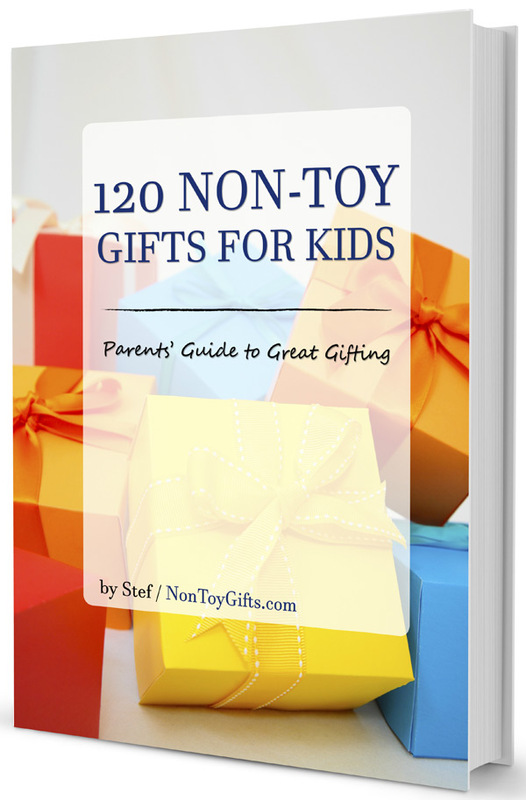 That’s why I created 120 NON-TOY GIFTS FOR KIDS as the ultimate parents’ guide to great gifting. Toys come and go but the gifts in this book will help create those wonderful memories that will stay with your child forever. When it comes to buying presents for kids, toys may seem the first and only option that we turn to. Seeing our children’s excitement when receiving a toy is the reason we resort to this in the first place. Unfortunately there are so many times when toys get forgotten and tossed in a corner after just few days. Selecting a good toy is not an easy task either. We end up with boxes full of toys and promise ourselves to be more selective next time. Sometimes we’re not much aware of alternatives. Alternatives that could be cherished long after Christmas or a party is over. Alternatives that could create lifetime memories. I hear many parents complaining about the amount of toys that enter their houses. What if we could change this? What if you had a great book that you could use as reference for Christmas, birthday or any other special event when you feel your child needs to be rewarded with a little or a big present? The 120 NON-TOY GIFTS FOR KIDS is designed to do just this. There are several toy alternative lists out there. What makes this book different and special? I have been blogging for a couple of years and one of my main goals as a blogger has been to research and share non-toy gifts for children. This book compiles the best ideas I came across and I also added many fresh ones that you haven’t read about before. Not only does 120 NON-TOY GIFTS FOR KIDS include toy alternative ideas but it is also loaded with tons of links to specific products and services. Many of them I have tried myself for my own kids or their friends and I genuinely recommend them. I hope this book will be an useful guide to help you through gift shopping. Stef is a former archivist who enjoys a good book, loves travelling and finds sewing relaxing. She is born and raised in Romania and lived a while in Belgium before moving to the States. Here she got married to a wonderful man and became the stay-at-home mom of two little boys. One day, feeling rather overwhelmed by the number of toys her sons owned and their little educational value, she put together a list of toy alternative gift ideas. It was this list that urged her to start the blog Non Toy Gifts, where she wants to inspire other parents who are also seeking memorable gifts for their children. This is a digital product, so nothing will be shipped. You will receive a PDF file that you will download and can print. “120 Non-Toy Gifts for Kids” is 100% satisfaction guaranteed. If you are not satisfied with the ebook, you will be refunded.